dNaga’s mission is to create work that reflects the culture in which we live and to explore our shared human experience. 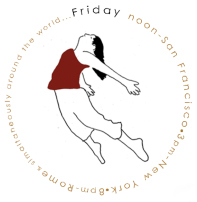 dNaga is an intergenerational dance company founded by Claudine Naganuma in 2001. Dance themes have included living with Parkinson’s Disease, medication trials, brain surgery, loss of loved ones, gun violence, gender bias, oppression, and racism. 2016 marks dNaga's third year of offering the GIRL Project to East Oakland girls. This year the company will also perform at the World Parkinson's Congress in Portland, OR in September.